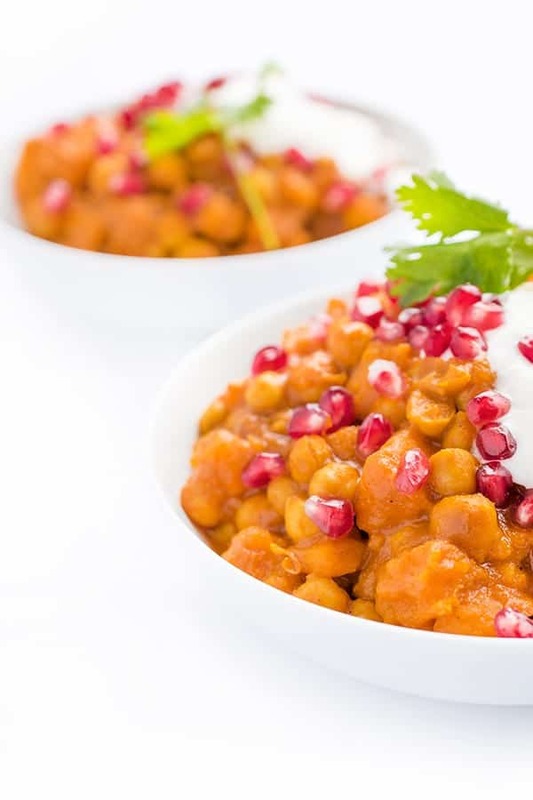 This protein-packed slow cooker vegetarian curry recipe is made with chickpeas and sweet potatoes cooked in a rich and creamy Indian-spiced sauce. Comfort food season is in full affect and when the weather is cold outside there is nothing I crave more than a warm bowl of Indian-spiced curry. Of course, truth be told, I use my Crock-Pot® slow cooker to make curry just as much in the warm months because I don’t have to turn on the oven! 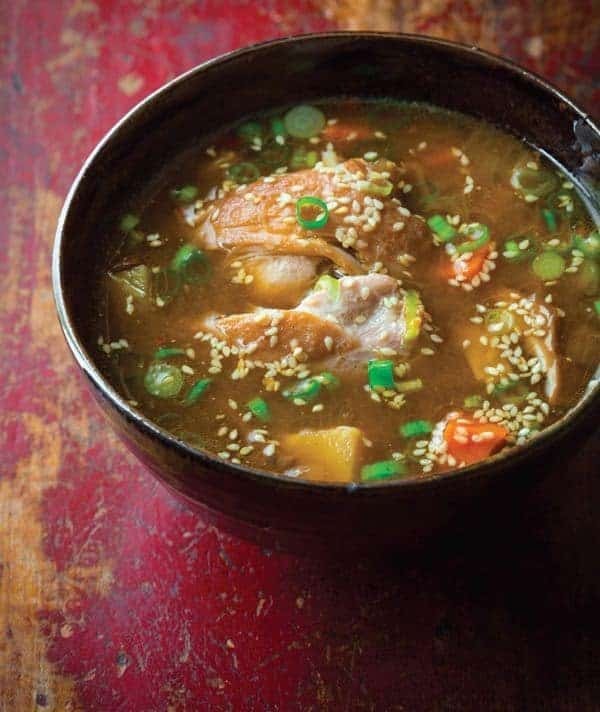 While I typically make my Slow Cooker Chicken Curry recipe (which happens to be the all time most popular recipe on my website! ), I also love skipping the meat and making vegetarian versions. To cool it down for my boys just before serving, I like to top it with a dollop of plain yogurt but that is completely optional. Pomegranate seeds add a touch of sweetness and a crunchy texture but it’s equally delicious without them. Want it a bit spicier? Serve with Sriracha. 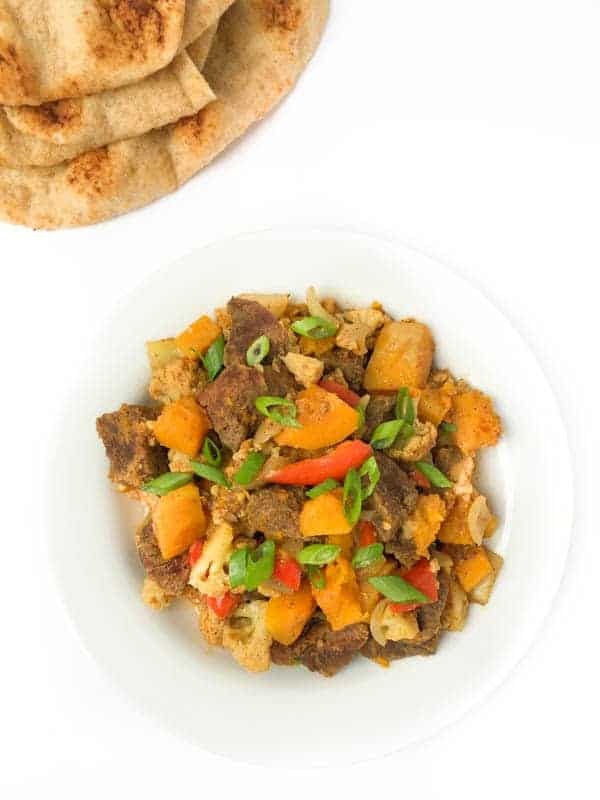 Place the sweet potato cubes and chickpeas in the Crock-Pot® slow cooker insert. 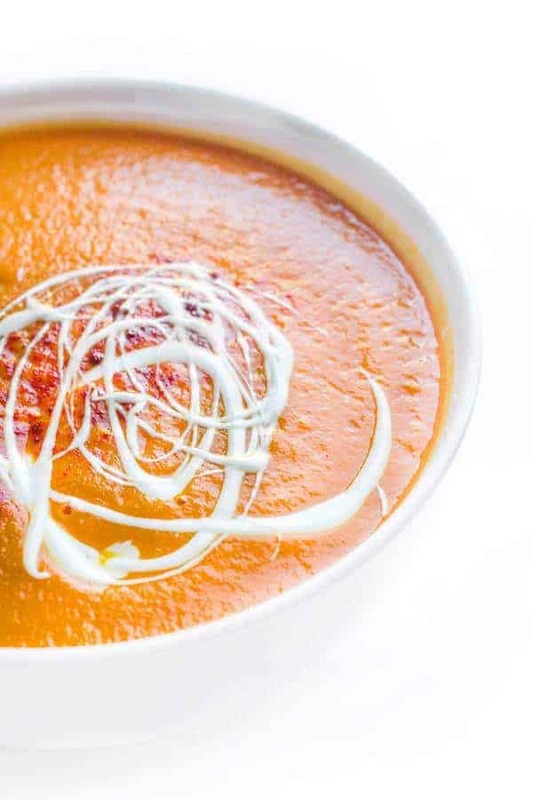 In a medium bowl, whisk together tomato sauce, vegetable broth, coconut milk, curry powder, garam masala, smoked paprika, salt and cayenne. Pour mixture over the sweet potatoes and chickpeas. 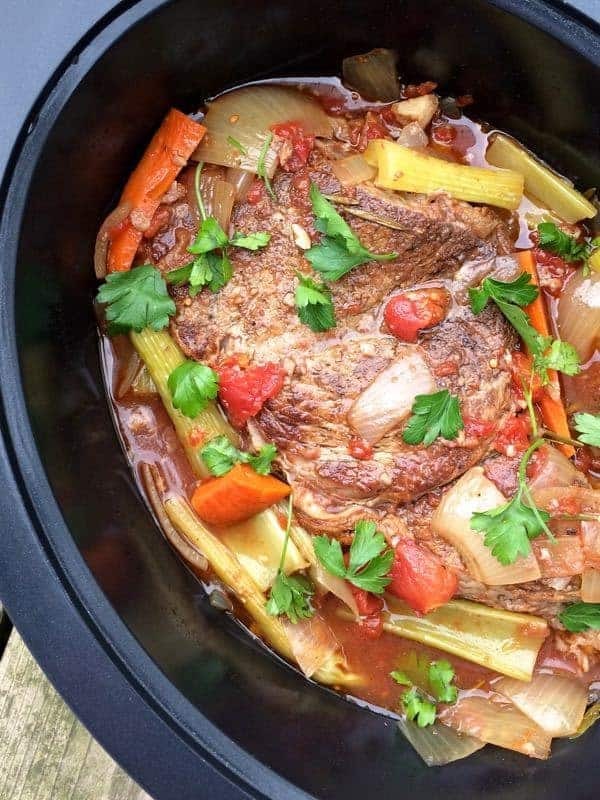 Cook in Crock-Pot® slow cooker and on High for 2 hours of Low for 4 hours. Disclosure: I am honored to be a Brand Ambassador for Crock-Pot® brand. For more delicious slow cooker recipes, click here! Thank you for supporting the brands that make The Lemon Bowl possible. All thoughts are my own. See more of my slow cooker recipes on my Pinterest board! would you recommend that this can be frozen? Simply awesome. I doubled the quantity and it came out great. Served it with multi colored qinuoi WOW. So happy you enjoyed it!!! Let me know what other recipes you try! It’s cooking for me right now, but I’m a little curious.. my sauce mixture came out very red. In your picture, yours looks like a creamy tan color. Any idea why there is such a color difference? What type of tomato product did you use? I used tomato sauce instead of tomato puree. Is that why? I also doubled the recipe (but I doubled everything, of course, not just the tomato). Yep that would do it! Either way does it taste good? I’m on weight watchers so portion control is a thing for me. I may be reading the nutrition info wrong, but it reads serving size is 1g. Is it one cup? Sorry about that!! It’s 1 1/2 cups!! :) I hope you love it! I felt a little adventurous and wanted to give curry and meatless food a try. I swapped the sweet potato for parsnips and leeks, neither of which I’ve worked with before, because I already eat a sweet potato for lunch every work day and I’m not clever enough to exchange that for something else. I used two whole cans of chickpeas, including the aquafaba for added protein and sauciness, and added a bit extra broth and (lite) milk for even more sauciness as I planned to (and did) serve this mixed with rice and a mess of vegetables. To compensate, I packed the spices into the measuring spoons and didn’t even try leveling them. That might have been a mistake, though, as this turned out so spicy I feel like I’ve had perpetual heartburn since I started eating it. Lol I’m pretty sure it’s messed up the pH of my stomach. Soo… I think I’ll hold off for a while on making more spicy food. Thank you for the recipe and the experience, Liz! That’s too funny!! Glad you had fun getting creative in the kitchen! The more you experiment, the better, in my book! This is another winner in our house!! I swapped the sweet potatoes for golden potatoes. O.M.G…..fantastic. We have left overs for 2 days and my 8 year old daughter already called dibs on it for her school lunch. Keep the recipes coming! Next up is the Slow Cooker Filipino Chicken. Thanks for making dinner exciting again!!???? I’m so glad you enjoyed it!!! Let meh now what you think of the chicken adobo!! Make me this right now!!! Looks so fabulous Lizzy. We eat curry like it’s going out of style! But, usually with meat. I love this meatless, slow-cooker version! Same here!!! I was surprised how satisfying the meatless version was!! haha – perfect! Happy new Year! An easy, healthy, and delicious recipe right after Christmas travels (and indulgences)? You read my mind! Added more chickpeas and cauliflower instead of serving over rice and am so happy with it. This one is a keeper for sure! Yay I’m so glad to hear it!! Such vibrant colors! Looks great! What a delicious, easy way to eat healthy in the new year.